When you first run eMMC Pro V1.09 sw will update your firmware . and makes it more stable and alot more powerful with more powerful features. ODIN Flashing failed on PIT known as PIT Failed. You can read Samsung eMMC Firmware's in case you have New Samsung eMMC in your hand which is not supported ! When there is a Qualcomm disk is connected you can choose eMMC Booster on the interface and write proper dump for it. eMMC Pro Software handle the procedures directly into Qualcomm Disk ! Configuring Partition Sizes is important if you do not have matching eMMC for another device . [Solution for :] MTK Devices or any Device for this matter should be able to match the original device (eMMC Configuration ) will let the device work properly . 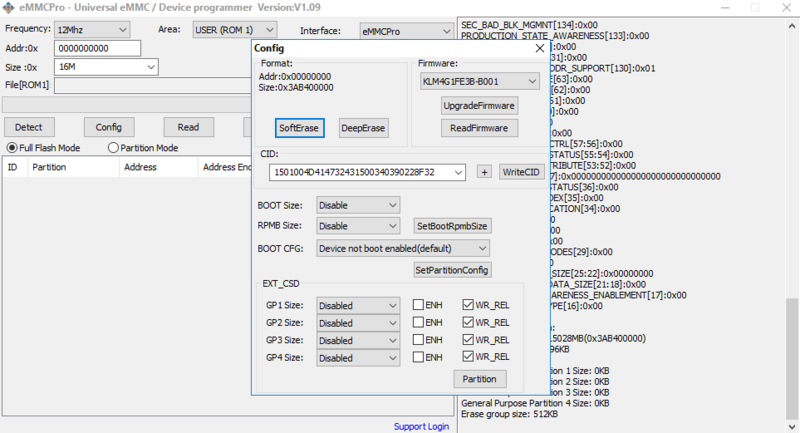 Writing any CID into device will help you configure Samsung eMMCs into any eMMC ! Solution for : Many MTK Mobile phones with unique CID determined ! Parse the preloader.bin and select in order to make it compatible eMMC CID . Modify and write the require CID into Device . Small Button with [+] Loads the preloader.bin and parse into Combobox you to select ! eMMC ID should match with the Firmware otherwise writing process will fail or will not work . •Box Firmware with New Functions and CMDs implemented .